Student Loan Forgiveness for Teachers. 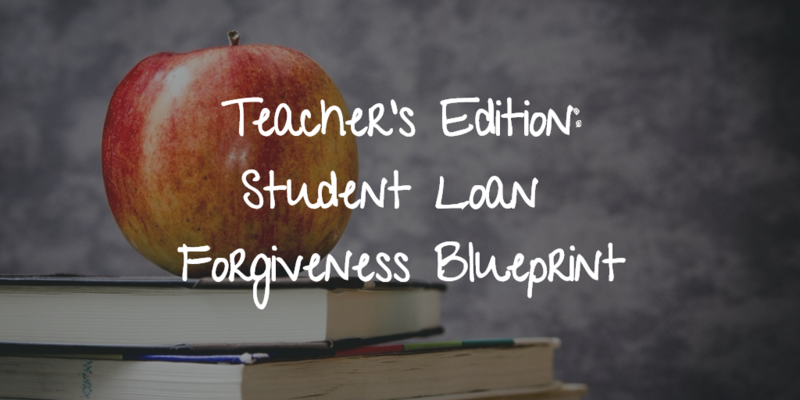 If you are a teacher (a person who provides direct classroom teaching, classroom-type teaching in a non-classroom setting, or special education teachers), this article will give you details on loan forgiveness programs designed specifically for you! You need to work in the public sector (federal, state, local government, tribal organizations, AmeriCorps, and Peace Corps). This may include military service, law enforcement, public school teachers and admin, and public health careers. The keys to forgiveness: Must be a federal direct loans (if your loans are not federal direct loans, consolidate your FEDERAL loans to direct loans), make 120 payments (10 years), majority of payments must be based on an income-driven plan (you can change this, if you are not using it currently), and work at least 30 hours per week. If your loans are already federal direct loans, complete the Employment Certification for Public Service Loan Forgiveness form to confirm your employment qualifies and EVERY YEAR AFTER. This form verifies that you have completed your employment required for the program each year. Completing this form requires you to fill in some parts and your employer to fill out the rest. While this is not a requirement, it is helpful for your servicer to track your eligibility. Who: Teachers who work at low-income schools are eligible for this program. Check out the Annual Directory of Designated Low-Income Schools for Teacher Cancellation Benefits to see if your school qualifies (check your previous schools as well). Which loans: Direct loans and federal Stafford loans are eligible for student loan forgiveness for teachers. Unfortunately, PLUS loans are not eligible for this program. The keys to forgiveness: You must teach in a low-income elementary or secondary school. You cannot have loans that originated before October 1, 1998. Your loans can’t be in default, and you need to work full-time as a teacher for five consecutive years. If you are a highly qualified teacher, which means obtaining state certification and holding a license in the state you teach in, you may qualify for a larger amount of forgiveness. Possible benefits: Up to $5,000 in loan forgiveness and up to $17,500 in loan forgiveness if you are highly qualified and work in math, science or special education. How to apply: If you have taught for 5 years (complete & consecutive), you can apply for the Teacher Loan Forgiveness program by completing Teacher Loan Forgiveness Application and then return your application to your loan servicer. Who: (1) Full-time teachers at low-income public or nonprofit elementary or secondary schools; See if your school qualifies. (2) Teachers that specialize in certain subjects, like math, science, foreign language, and special education. (3) There are other special circumstances that make teachers eligible for this program which are: working in a private school that has its nonprofit status, working at an educational service agency or teaching in a designated subject shortage area. Which loans: ONLY federal Perkins loans for this program. Possible benefits: Teachers must work full-time for a full academic year to qualify for loan cancellation and after 5 years 100% can be cancelled! 15% of your loans cancelled for the first and second years of service. 20% of your loans cancelled for the third and fourth years of service. 30% of your loans cancelled for the fifth year of service. 100% of your loans cancelled AFTER five years of service. How to apply: You will need to request certain forms from the office that administers your Federal Perkins Loan Program at the school that holds your loans. You will need to provide various documents at the school’s request. The school is in charge of determining whether you qualify or not for the loan cancellation. There are no specific programs currently available in PA (PHEAA website 3/15/16), go figure! Ask your loan servicer if your state or city offers any current loan forgiveness programs. This changes often so check back at least once per year. With our current teacher clients and friends, the major issue I have seen thus far has been eligible teachers paying their loans back for years; however, they were not federal direct loans or they were not consolidated. Guess what happens, all those payments don’t count towards your forgiveness! Another issue is that clients don’t sign up for an income-based repayment plan. A majority of payments have to be paid based on an income-based repayment plan to qualify for public service loan forgiveness programs. If you may qualify for any of these programs, you should contact your loan provider. Ask them if your loans are federal direct. If they are, you may qualify for both the Public Service Loan Forgiveness Program and the Teacher Loan Forgiveness Program. If not, ask if they are Stafford loans because they can still qualify for the Teacher Loan Forgiveness Program. Any remaining loans may want to be consolidated to direct loans.